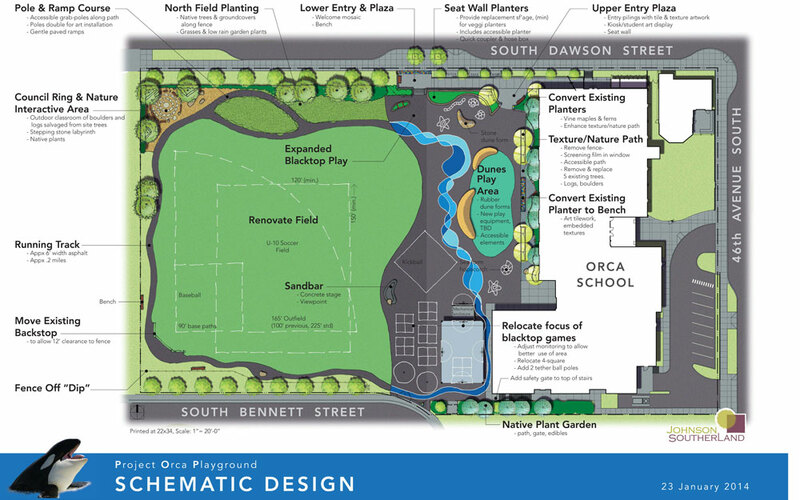 Project Orca Playground (POP) is spearheading the redevelopment of Orca K-8’s school playground and playfield to include more opportunities for play, physical activity, outdoor learning, and community building for the school community and the surrounding neighborhoods. The POP committee– in partnership with the Orca staff, faculty, and PTSA; the City of Seattle, and Seattle Public Schools– has been working since fall 2012 to realize this vision. The POP Committee has thus far successfully applied for and won two Department of Neighborhoods Small and Simple grants totaling $50,000. The first grant funded a robust community engagement process facilitated by a professional landscaping firm who worked with the school and surrounding public community to create a design that addresses the needs of all shareholders. The second grant is being used to prepare construction and bid documents for Phase 1 of the project. It’s a great website, full of designs, info, and ways to get involved. Click here to check it out and find out more.